It was a Saturday afternoon and the weather was perfect for a butterfly outing. I headed for Upper Seletar Reservoir Park. I got to the place at around 2:00pm and as usual, I was welcomed by its serene and quiet environment. Hoping that I could spot a Saturn, the Plane or a Dark Blue Jungle Glory, I decided to check one of the well-shaded trails which are the known habitats of these species. After walking around for awhile, I spotted a pristine Branded Imperial (Eooxylides tharis), resting on a leaf near me. This species prefers shaded forests and is quite often encountered along the trails at this reservoir park. 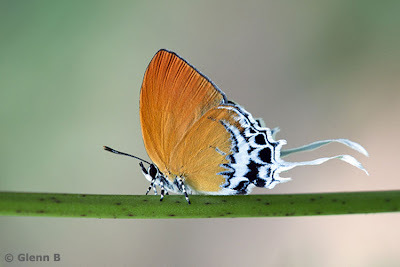 I am very fond of these butterflies because of their fascinating reddish-orange coloured wings and their two white tails that twirl elegantly in the breeze. When the butterfly positioned itself on a stem, I did not waste any time and quickly took several shots of it. This is my favourite shot amongst the many shots that I took of this Branded Imperial. I started butterfly photography using the manual mode on my Nikon D90. Shooting in this mode gives me more flexibility in adjusting the needed settings and allows me to easily correct exposure levels during the post processing stage. But this doesn't work all the time, especially if your subject is a butterfly. Butterflies are skittish and move from perch to perch frequently. When they land in a different lighting environment, frequent re-adjustments of the camera settings are required - something that has to be done quickly. Thanks to my friend Bobby Mun, a ButterflyCircle member, who shared with me his technique of shooting in Aperture Priority Mode and using the flash as a fill light. This eliminates the darker backgrounds that I tended to get from my earlier outings. Using the camera's technical capability to assist me, I can now concentrate more on composition and getting the shot right without frequent re-adjustments on my camera settings. I enjoy butterfly photography because it gives me a chance to appreciate nature and enjoy its beauty. The sense of communion with the environment has always been rewarding to me. It doesn’t matter if I go home with only a few good shots. For me, every butterfly outing I do is worth the effort and an opportunity to enjoy the peace and quiet in this busy city.